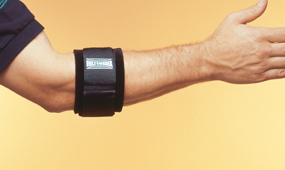 The Hely & Weber wrap-around strap provides support and compression to treat forearm injuries and epicondylitis. The neoprene wrap is adjustable for warmth and compression. The wrap is easy to apply and effective for conditions including tennis elbow. The Hely-Weber Universal Neoprene Strap is a wrap-around neoprene band which provides support and compression to a wide area of the forearm. The strap is used to primarily to treat muscle injuries of the forearm, and can also be used for epicondylitis pain (tennis elbow, golfers elbow, or little league elbow). The strap also helps to retain warmth in the area for improved circulation and tissue soreness. The neoprene is easy to clean and the strap is universal for the right or left arms.